If You Want Something Great ... You've GOTTA See Yates! Design Your Own Custom Ring! Our team loves helping folks design amazing jewelry. 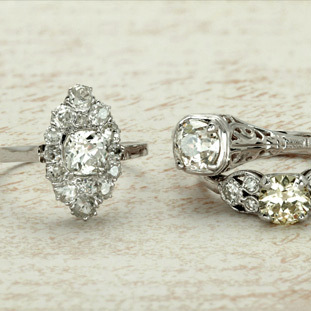 Wouldn't it be great to have an heirloom quality, custom designed piece of jewelry? See a picture of something you really like in a fashion magazine? Maybe a celebrity is wearing it. Want to use your diamond and restyle your ring? Or maybe you inherited a special diamond and you want to make something beautiful with it. We can help. Let's get together and make something truly unique and beautiful - just for you. Questions: shoot us an email, call us or come in and see us. Step 1: Idea - Have you seen a picture of a ring you just love? Maybe in a style magazine, or on a celebrity. We can work with you and sketch out your ideas. 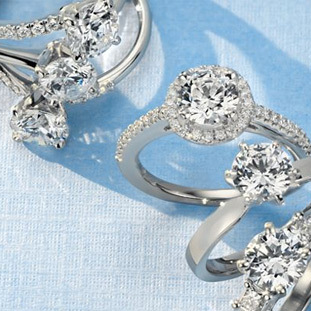 Customize the design to your diamond (or any gemstone) size and shape. Step 2: CAD - Once we have the idea sketched out, we calculate measurements of width, depths, stone sizes, etc. Then a day or two later, we get a CAD (computer assisted design) drawing for you to look at. Step 3: Model - After you approve the CAD drawing, it's time to build the wax mold. If you are really a hands on person, we can show you the wax mold. You can try it on for size and get a good idea of how the finished piece will look. Step 4: Finished Piece - Then the real exciting part happens. The wax model is cast into your metal of choice - 14K, 18K, 20K white, yellow, green or rose gold; platinum or palladium. Stones are set, metal is polished, and any hand detailing is done. And you get to realize the masterpiece you helped to create! Watch the video below for an idea of how the process works. You love beautiful jewelry. And you love great deals, right? Then sign up for our Diamond Deals newsletter.